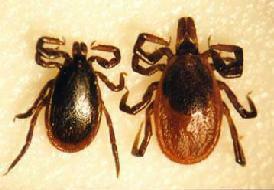 Blacklegged ticks can transmit the bacteria that causes Lyme disease. These ticks are common in Florida. According to the Centers for Disease Control and Prevention, the Sunshine State ranks among the top 20 states in the number of cases reported each year. Dr. Shirley Hartman of Jacksonville specializes in treating Lyme disease. She says the number of possible symptoms makes diagnosis difficult. Among them: muscle pain, nerve pain, joint pain, numbness, brain fog, depression anxiety, lupus, rheumatoid arthritis, chronic fatigue syndrome and fibromyalgia. Doctors recommend using a tick repellant on clothes, shoes and skin when going outside and checking yourself for ticks at least once a day. Animals can also get Lyme disease. According to the Companion Animals Parasite Council map, more than 460 dogs contracted Lyme disease in Florida from January to March of this year. For a long time, the tiny deer tick was thought to be the only carrier but University of North Florida researcher Dr. Kerry Clark found common black-legged and lone star ticks can also transmit Lyme.